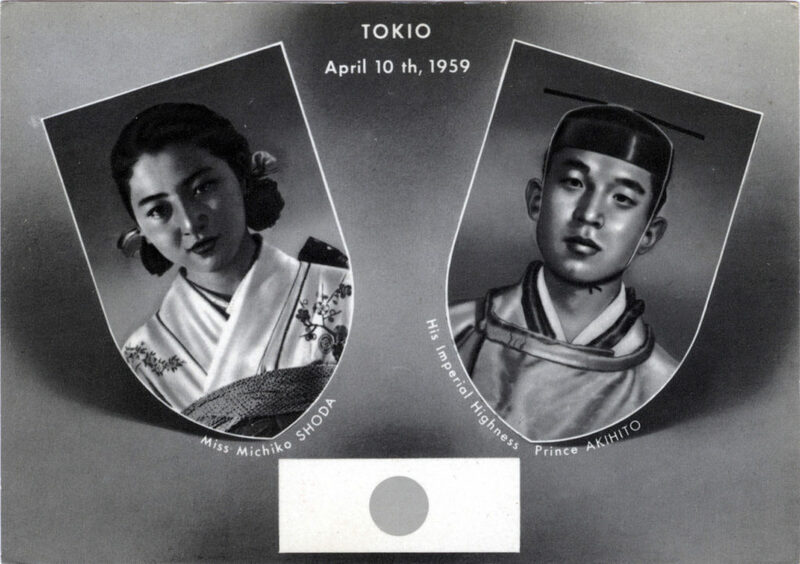 A commemorative postcard depicting His Imperial Highness then-Crown Prince Akihito and his betrothed, commoner Michiko Shoda, on the occasion of the wedding on April 10, 1959. The couple are Japan’s current (2016) Emperor and Empress, although the emperor has expressed a wish to abdicate within the next few years due to health concerns. Imperial wedding commemorative stamp, 1959. “The postwar democratization of the palace was expressed in the entry of commoner women into the imperial family. After the aristocracy had been abolished, everyone, except for the small imperial family, became a commoner. 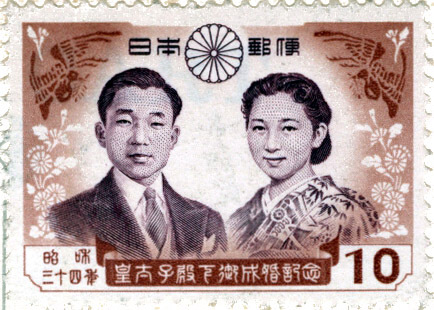 “In 1958, the government announced that Crown Prince Akihito would marry Shoda Michiko. the daughter of the president of [Asia’s] largest flour-milling company, a well-to-do businessman who was not a member of one of the former aristocratic families, which had previously provided brides to the imperial family. “The announcement created excitement, because the match was presented as a love affair between the prince and a commoner girl, whom he had met on a tennis court, not an arranged engagement, as had always been the case in imperial family weddings.